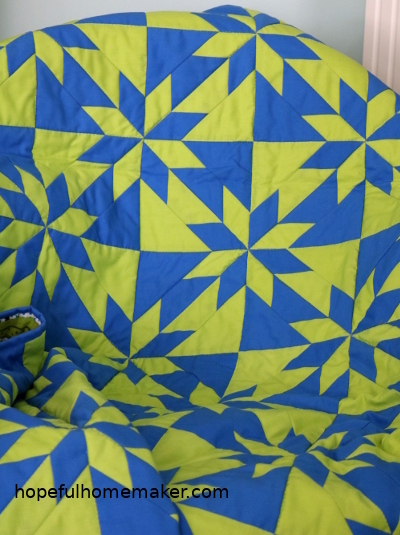 While writing my Hunter’s Star quilt pattern, I cut fabric for a second version in blue and green. 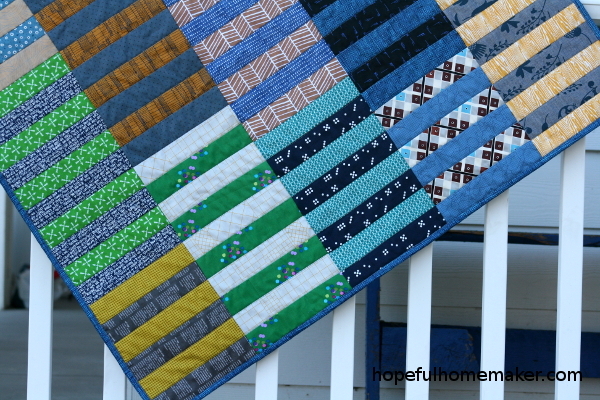 This quilt top is all solids and I chose colors that play off each other to really grab the eye. 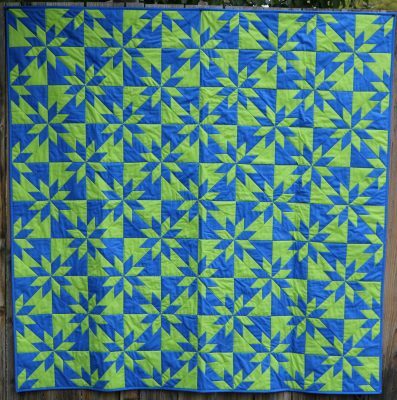 The blue is the same color I used in my Lucky Lone Star quilt, and the green is somewhere between a lime and a chartreuse. I quilted this version with straight lines, following the seams in a ditch-stitch method. 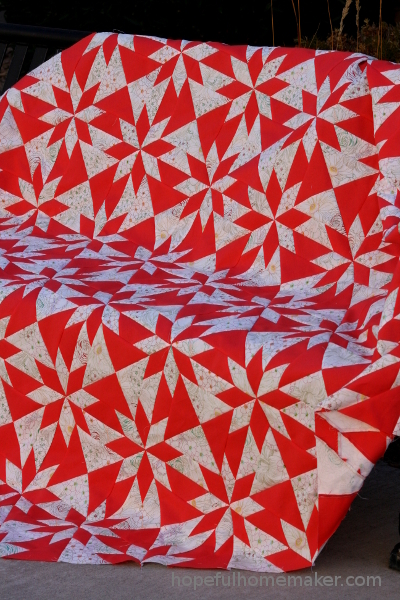 It turns out that the Hunter’s Star quilt pattern is my favorite for gift-giving right now; I may make a third if time allows. No special rulers or templates, no fabric waste. My kind of quilt. Since this is version two, and because I shared my random high school physics story along with version one, it seems only fitting to share my other random science class story now. It was my sophomore year of college and I was knocking out the last of my GE requirements, one of which was Physical Science. I looked forward to seeing the cute boy I often sat next to, but everything else I could do without. Especially the monotone voice of the professor. And then there was one day – just one, mind you – when he was a little more interesting than usual. He actually brought an object lesson to demonstrate his principle and talked with a little more animation. His lecture topic: centripetal and centrifugal forces. His object lesson: a large bucket of water. Surprise, surprise. He began the age-old demonstration of swinging the bucket in a large circle to demonstrate how it stayed in the bucket without spilling. Of course it worked… until he slowed to a stop. Suddenly a ball of water shot out of the bucket and straight into my face. I still remember the slow-motion feeling of watching a ball of water move through the air toward me, the blurry face of the professor on the other side of the strange shape. Me, my notes, my desk, my bag – all wet. The students to my right and left got a drop or two on them; those above and below me felt nothing. He paused for a fraction of a second to blink and observe what he’d done, then continued his lecture without a word to me or even a change of expression on his face. I couldn’t decide what was funnier; the water or his total disregard for his mistake. So there you have it, my most memorable experience from my university science classes. Moral of the story: never sit in front of the professor if he shows up to class with a bucket of water. 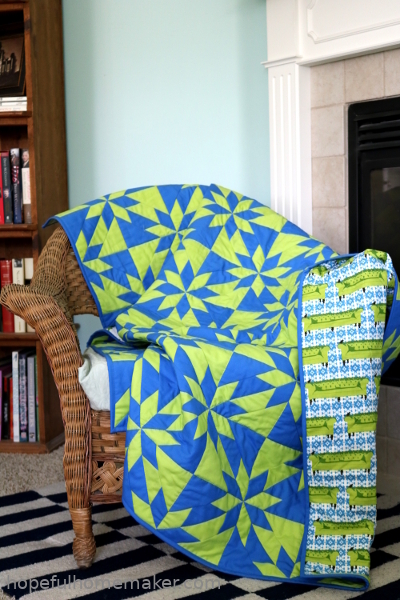 Moral of the photos: make more Hunter’s Star quilts. 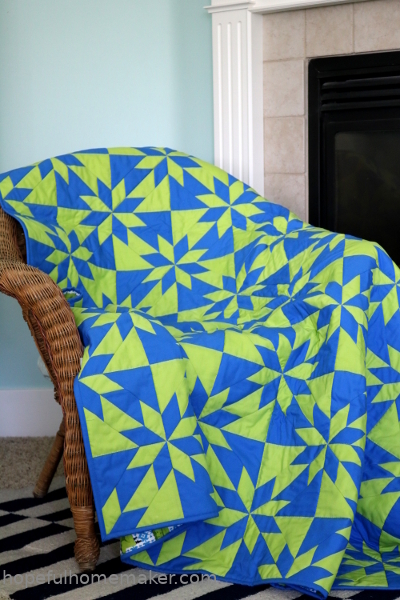 The Hunter’s Star quilt pattern is available in my Etsy shop. Buy yours today! I love it when traditional quilt blocks enjoy a surge of popularity. The Hunter’s Star is certainly one of them right now, and for good reason. It makes a gorgeous quilt! Ready for a quick story? I had a very eccentric Physics teacher in high school. He was a lot like Doc Brown from Back to the Future, crazy hair and all. His desk was covered with bumper stickers that were far from politically correct, even for the late 80’s. It was, however, at the end of that year of Physics that he surprised us one day and with an awards ceremony. He did it every year for each of his Physics classes. And so he proceeded to read a list of various awards and names of students and I settled in to listen. I had done well in his class, but I was certainly no physicist in the making. Then came an award he said needed an explanation: in every other class he’d given it to the hottest girl or guy in the class. But in my class, he awarded it instead to the person that everyone wanted because they knew they’d get an A. Without further fanfare he read my name and gave me a certificate that said “most desired lab partner.” It lay on my desk as I sat wondering what to think: Not very pretty but dependable? She cares so much about her grades that she will do your work too? While you go flirt with the pretty girl? In the end I shrugged it off. He was just odd enough he may have thought it was the compliment of the year. I’d forgotten about that award until I was looking at these pictures today. Quilting isn’t a multi-generational craft in my family; I discovered it on my own and just sort of wandered around, learning a little here and a little there for years before I found a group of quilting friends and felt like I belonged. 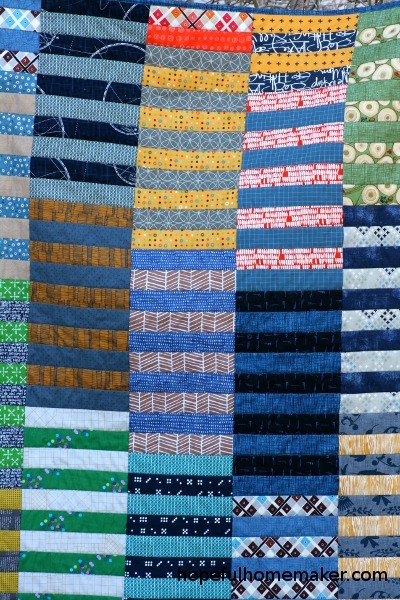 I’m often just as impressed with traditional quilt blocks as I am with modern designs. To me they’re all pretty new and most of them strike me as both traditional and modern. 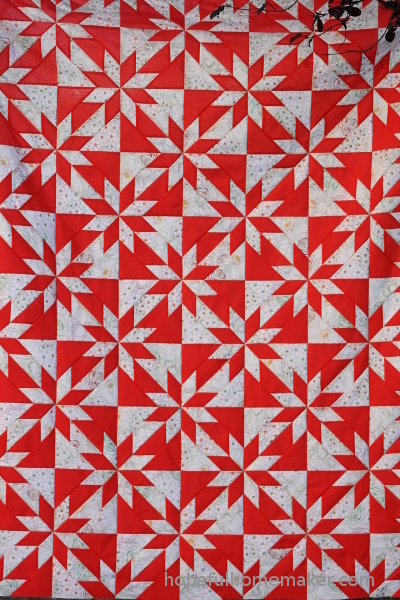 Like many other traditional quilt blocks, the Hunter’s Star deserves the award, “most desired quilt pattern,” not because it’s the hottest new trend, but because you can depend on it to deliver a beautiful quilt every time. 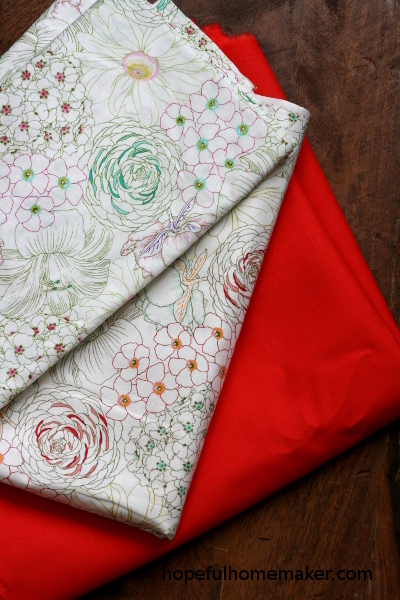 With just two fabrics, you create something that makes people pause to look a little longer. This pattern is one I first made years ago in a traditional red and white color scheme. The method is fast and fun, with no half square triangles, extra seams or Y seams, and almost zero waste. 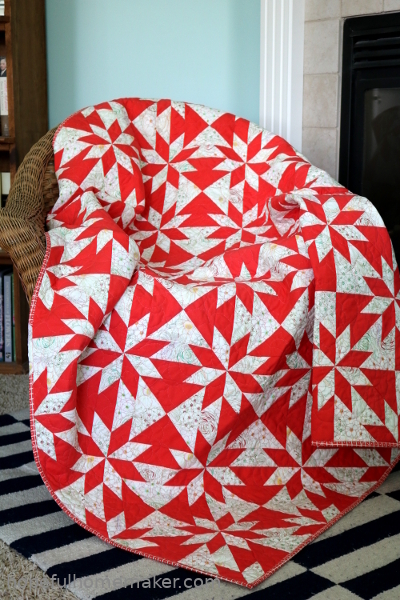 The Hunter’s Star block was the perfect way to use my beautiful low-volume floral fabric. 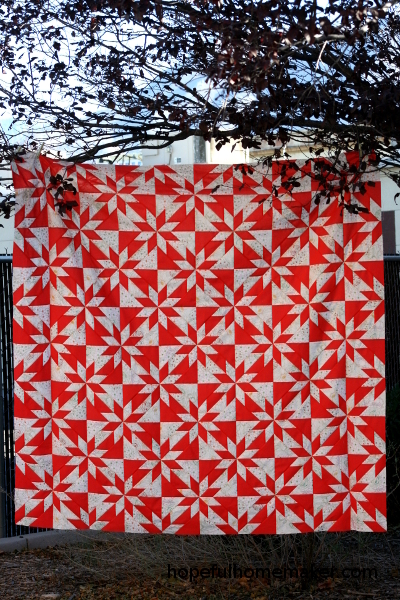 I added a geranium-colored solid (Moda Bella color 9900 258) and made a quilt so bright and happy it almost glows. After years of requests for the pattern, we’ve written it. You can find it here in my Etsy shop. And unlike my Physics award, when it’s finished you’ll know the compliments are sincere. 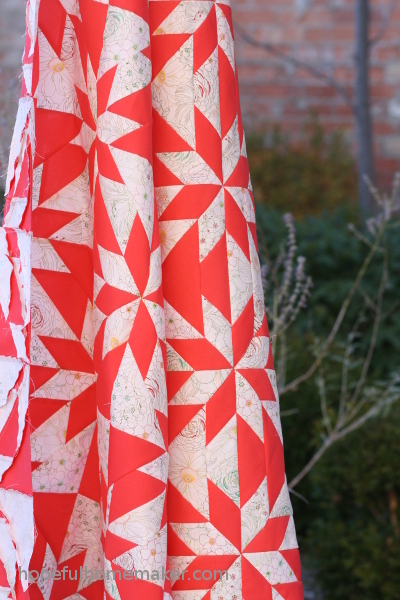 This quilt pattern is both dependable AND pretty. 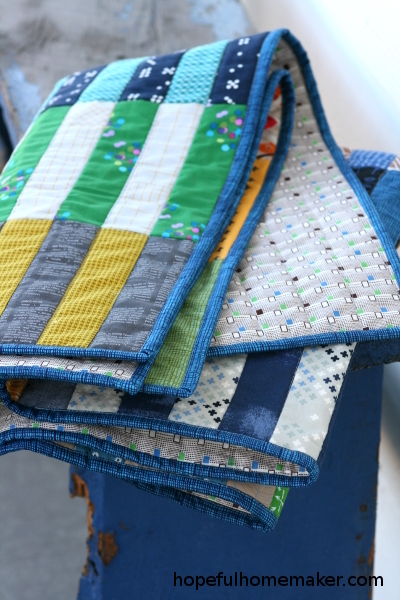 Few things gratify me more than gifting quilts I’ve made. If that quilt is for a beautiful little baby, then it’s even better. 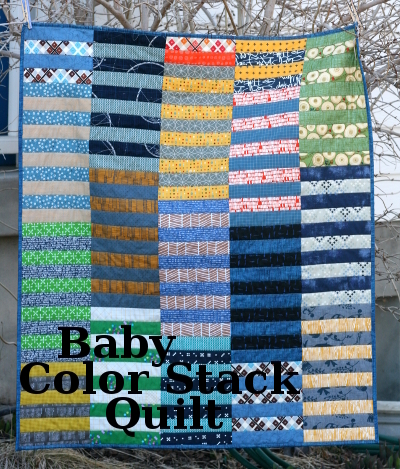 The Baby Color Stack quilt is a modern quilt pattern which is fast and fun to make. It’s a perfect gift for the bundle of joy on it’s way to the arms of someone you love. 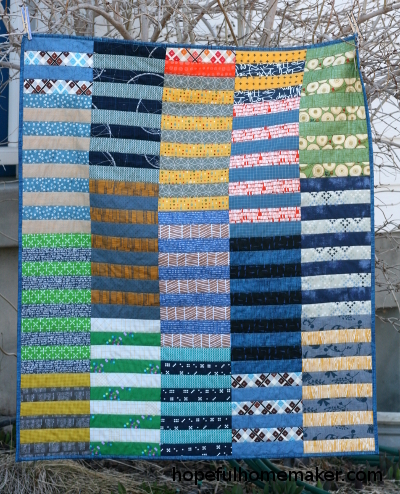 As I write this post I sit curled up under my original Color Stack Quilt. It makes me smile to see so many colors and favorite fabrics together. 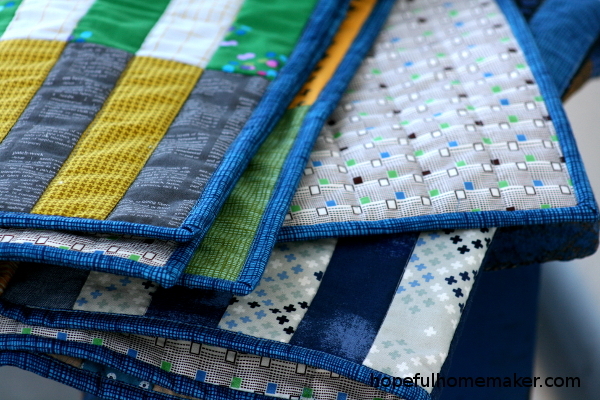 The Baby Color Stack quilt is no different. This year has been the year of the boy among my friends and family members and I wanted to make something for them with a modern, yet simple, design and good color sense. I re-worked the measurements for the original design so the block would look good on a small quilt. I love how it looks, with so many shades of blue, gray, black, brown, and green plus a bit of yellow and orange to pull it together. The Baby Color Stack quilt measures 38″ x 45″. The pattern is available in my Etsy shop, bundled with the original Color Stack pattern for just $5. Download the pattern today! Please note, the Baby Color Stack pattern is only available in the pattern download. It is not included in my original Color Stack tutorial. For the quilting I opted for straight lines by ditch-stitching the vertical seams because I didn’t want any quilting to compete with the fabrics as they worked together. The backing is a print from the Katie Jump Rope collection by Denyse Schmidt, and the binding is an Alexander Henry heath print in a gorgeous vivid blue. I have already made a few different versions of this quilt. It’s my new go-to pattern for baby quilts. I enjoy choosing the fabrics and I can finish the quilt in as little as a day, making it a fast (and last-minute) option for gifting. Download the pattern today and you’ll be ready for your next baby gift!